Update: Opera discontinued the free Opera VPN iOS app on April 30, 2018. They continue to offer a free Opera VPN with their desktop browser. 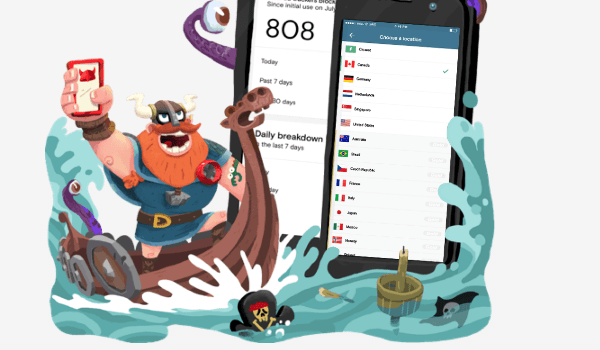 Opera (formerly Opera Software ASA) of Norway recently announced the inclusion of a free, integrated virtual private network (VPN) with its desktop web browser. 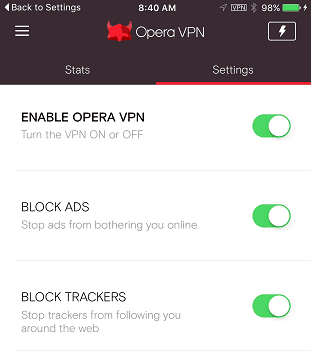 Opera has since launched an app for iOS to extend the VPN capability to the mobile platform. The app is available to iOS users for free, and is available for iPhone and iPad. By installing and enabling the free Opera VPN iOS app, users can change their virtual location. The app allows users to change their virtual location to one of five regions — United States, Canada, Germany, Netherlands and Singapore. The VPN assigns an IP address to your device from one of those regions. 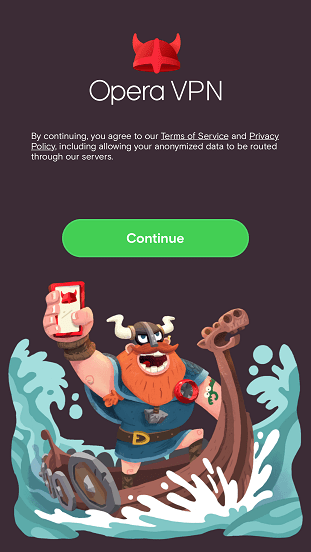 The free Opera VPN iOS app not only changes a user’s virtual location, it includes an ad-blocking option, and a tracker-blocking option too. The built-in ad blocker works on ads in Safari and Chrome. The app has easy access to toggle options on and off, and to display and change virtual locations. Get started by downloading the app from iTunes. Opera VPN needs to enable push notifications to let you know its status. Tap the Continue button to proceed. 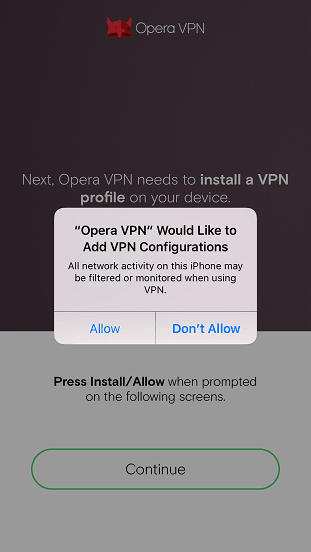 Opera VPN will ask you to allow it to add VPN Configurations. If you want to allow this addition, tap Allow to proceed. With basic set-up completed, the Stats tab will display. 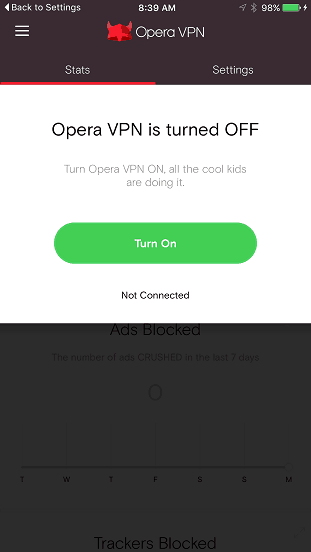 A prompt to turn on Opera VPN will display. Tap the Turn On button to continue. The Settings tab will display. The status of the VPN, ad-blocker and tracker-blocker options will display. Tap the toggle buttons for each option to turn them on or off. With Opera VPN enabled, the app will auto-select the closest region as your virtual location. 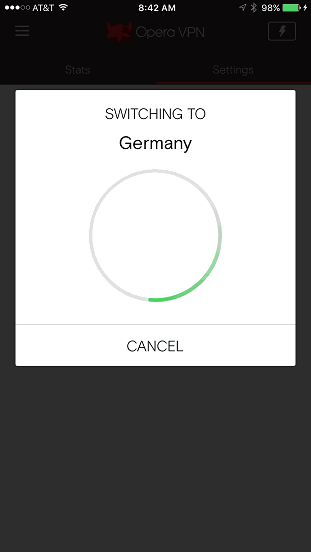 Tap a country under Choose a Region to change auto-select to a specific region of your choice. For example, tap Germany. Opera VPN will switch to Germany, and assign your iOS device a German IP address. Launch Safari on your iOS device. Note the VPN icon in the status bar so you know Opera VPN is enabled. 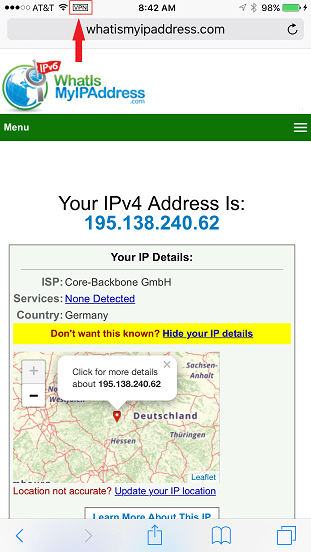 Use an IP look-up web site to verify your current IP address. From the Opera VPN app, tap the Region button at any time to select a different region. 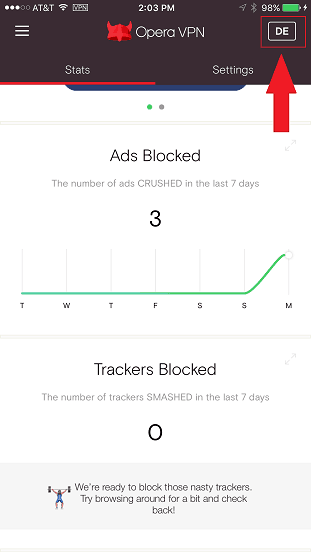 Tap the Stats tab to check the number of ads and trackers blocked by Opera VPN over the past week. Thank you for visiting Tech Help Knowledgebase to learn how to use the free Opera VPN iOS app.